StopCISA: The Cybersecurity Information Sharing Act is a disaster. The Cybersecurity Information Sharing Act gives Internet service providers perverse incentives to spy on users. The “NO CISA” protest organized by Fight for the Future, CODEPINK, Restore the Fourth, the American Arab Anti-Discrimination Council, Defending Dissent, and Bill of Rights Defense Committee, against the Cybersecurity Information Sharing Act (CISA), on Oct. 23, 2015 in Washington, D.C. There are two basic problems with the so-called Cybersecurity Information Sharing Act, which is scheduled for possible amendment in the Senate on Tuesday. The first is everything the bill, generally approved by the Senate last week, does. The second is everything it doesn’t do. In effect, the bill aims to sidestep search warrants and other pesky due-process limitations on government by giving technology companies a motive to “share” what it calls “cyber threat indicators” to the Department of Homeland Security. S. 754 gives tech companies—which receive troves of data from Internet users—huge incentives (like protection from legal liability) for “voluntarily” sharing these potential “cyber threat indicators” with government agencies. This language could apply to anything. Example: I already have lawful access to my own computers. But what if someone writes up a cautionary note about how to delude me, perhaps through a phone call, into voluntarily giving over my passwords to these systems. She then sends it to me by private email so I can check whether she’s right. But if she does so, isn’t she describing or identifying a method to cause me, with my legitimate access, to defeat my own security-control tools? The law would allow Google (my email provider) to voluntarily share that private email with DHS. That seems like a bad, unintended outcome. [T]he bill would also let law enforcement and other government agencies use information it receives to investigate, without a requirement for imminence or any connection to computer crime, even more crimes like carjacking, robbery, possession or use of firearms, ID fraud, and espionage. … While some of these are terrible crimes, and law enforcement should take reasonable steps to investigate them, they should not do so with information that was shared under the guise of enhancing cybersecurity. So CISA is expansive about what kinds of information companies would be motivated to share with government agencies. But it provides scant justification for this “sharing.” But “sharing” is plainly a euphemism for surveillance, enabling bulk collection of Internet data that, because it begins with private companies, wouldn’t even require the kind of broad legal authorities that, for example, the Foreign Intelligence Surveillance Act provides. What CISA doesn’t clearly do is actually prevent or deter Internet crime or espionage. National security expert Patrick Eddington at Cato has pointed out that there’s little evidence that that “sharing cyber threat indicators” will enhance Internet security. And how would the “shared” information be protected? Given the massive data breach at the federal Office of Personnel Management, maybe it’s not a great idea to give “cyber threat indicators” in bulk to government agencies that have failed to put good security measures in place. A company with little to no security, focused only on its core business functions, is not going to put threat intelligence to effective use. Until [a] company invests in sound defensive strategy, processes, people and technology, no amount of information sharing will help it. Since this summer, the growing opposition to CISA among all sectors has been so remarkable that it’s difficult to explain how the bill has advanced so far with so little effort to address its problems. Part of the answer has been the unstinting, consistent support for CISA from the U.S. Chamber of Commerce, which perceives the bill as a big win for American companies on the liability front. The authorization to share cyber threat indicators and defensive measures with ‘any other entity or the Federal Government,’ ‘notwithstanding any other provision of law’ could sweep away important privacy protections, particularly the provisions in the Stored Communications Act limiting the disclosure of the content of electronic communications to the government by certain providers. If DHS, of all agencies, thinks maybe your legislation undermines other privacy laws, including the Stored Communications Act (aka the Electronic Communications Privacy Act), isn’t that a good reason to slow down, Congress? More importantly, DHS has put its finger on precisely the issue that always has bugged me about CISA: Why have we focused so hard on reforming a three-decades-old email privacy law and the Patriot Act if we’re going to pass a wholly separate law that erodes those reforms? That “notwithstanding” provision is the clearest thing in an unclear bill; it says that, regardless of what other laws Congress has passed that limit surveillance, Congress now plans to undo those limitations. The Senate amendments process, set to begin Tuesday, is a chance to raise some of these issues, but hardly all of them. The Center for Democracy and Technology has provided a handy guide to possible CISA amendments that will be brought up on Tuesday, but even CDT seems implicitly to have acknowledged that CISA as a whole holds a first-class ticket on a bullet train toward passage. Still, the amendments debate Tuesday will give us a few more opportunities to raise objections to overall CISA’s surveillance-friendly language and design. And even if the Senate bill passes in some form, it still will need to be harmonized with its House counterpart in conference committee. For who have problems with CISA’s text or its larger framing of cybersecurity problems, decidethefuture.org will let you email, tweet, or call your senator, while faxbigbrother.com offers a similar service via a decidedly less-fashionable communications platform. 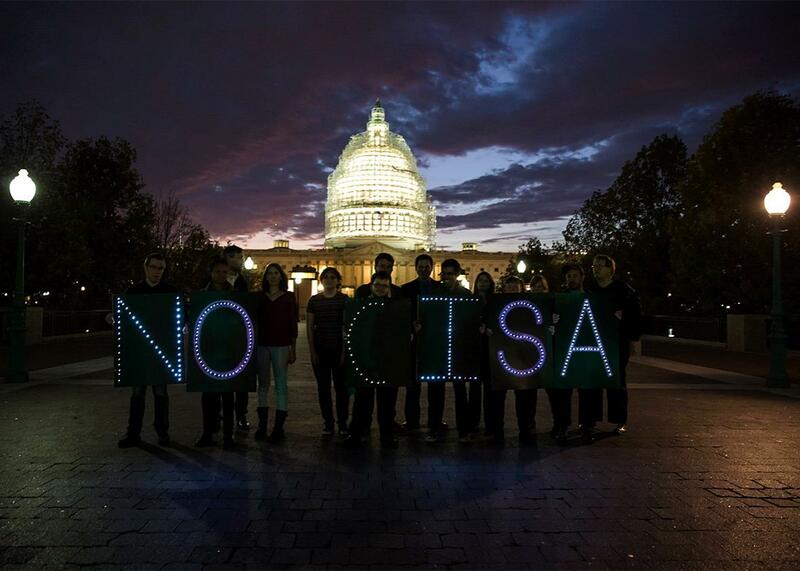 Given sufficient outcry, perhaps lawmakers will send CISA back to the drawing board.